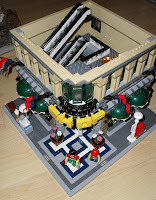 Brick Town Talk: GE 10211 - First Floor Finished - LEGO Town, Architecture, Building Tips, Inspiration Ideas, and more! Lots of lovely windows. 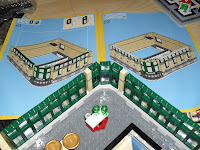 Just like I have plans for my Fire Brigade, I think once I have built the Grand Emporium I will expose some of the windows by taking out some of the log bricks. 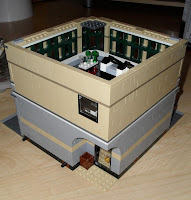 It is becoming my favourite modular building and I haven't finished it yet. Looking good so far! Hopefully you can get it all finished by the end of the evening. Happy times!